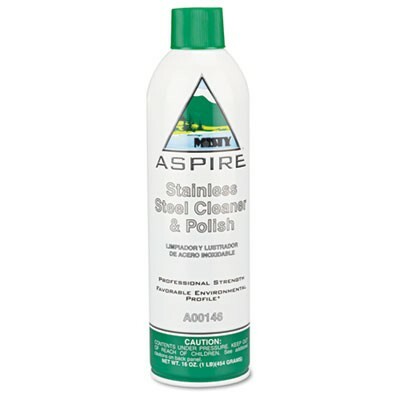 Aspire Stainless Steel Cleaner & Polish, Lemon Scent, 16oz Aerosol - Put a shine on stainless steel, chrome, aluminum, brass and other metals with a cleaner that's 98% free of volatile organic compounds. Fast-foaming action requires no buffing and dries to a non-oily film. Solution is water-based and nonflammable. Contains no silicone or wax to build up on surface.